For further details please click anywhere on image. 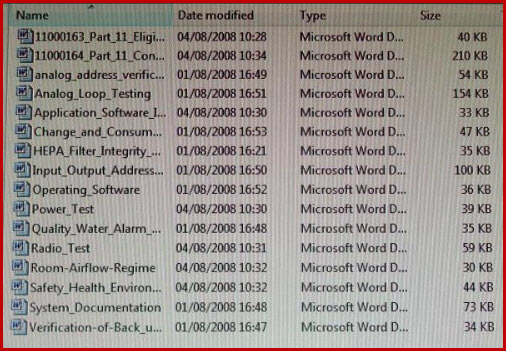 This Corporate Validation Manual (CVM) is supplied loaded to a memory stick (MS) and complete with the attachments that are listed in the graphics below. These high quality documents and protocols are all constructed in Microsoft Word. Each document is preceded by an SOP which prompts you through the procedure of populating and then customizing the template, into your own bespoke company document. This CVM has real documents, detailed, compliant and interactive, but most of all - Highly Cost Effective. These document have evolved through over thirty years of joint validation expertise, they will free up a lot of your time and enable you to deliver your validation projects and tasks on time. For the validation professional, this corporate validation manual is an extremely useful tool, for the new comer in validation, it gives a huge boost to confidence and actually makes you look good. To have this material on hand is incredible and to be able to download and populate an IQ in minutes, or six IQ’s in an hour, is quite awesome. Remembering always that these are the best FDA Compliant document templates available anywhere. Get started in pharmaceutical validation. The cost of the FDA Compliant, Corporate Validation Manual, will be recouped in the first few weeks, it will then go on to show a very healthy return on your original investment. Corporate Validation Manual CHAPTER 1 TO 13 HEADINGS. It would appear the established colleges have not managed to establish validation as a separate subject, yet they have been slow to integrate into existing courses knowledge of GAMP 3/4/5, or GMP's, or 21 CFR Part 11, or EMEA 726-2004 Degree qualified persons looking for employment in the pharmaceutical and medical device manufacturing industry arrive in production plants with little or no comprehension of FDA or MHRA or WHO rules and requirements. Validation is the number one priority in these plants, fall down on your validation and the regulators (FDA / MHRA / EMEA/ WHO) can fine you, remove your approval to manufacture, or even close you down. Losing your manufacturing rights for a drug that has taken hundreds of millions to develop, is catastrophic, even to the major international companies. Good validation ensures that this does not happen. Validation is a mixture of skills, and the manual is designed to interlink with your existing skills and add the required mix of Quality, Instrument, electrical and mechanical knowledge to enable you to work as a validation technician or engineer or consultant in the pharmaceutical or biotechnological or API or Medical Device, industries. In validation you are not designing, you are verifying that equipment or installation and use; conform to certain standards. This involves authoring a document train that starts with the URS follows with IQ / OQ and usually finishes with the PQ, normally difficult and complex documents - but in your case - they are all on the manual Corporate Validation Manual DVD, ready for you to download. Using the manual is a great way to receive training while maintaining full time employment, and to feel confident that this Corporate Validation manual has the answers or can point to where the answers are for any validation problem you may run into.